Online engineering camp is all about power! Or as we call it in Minecraft, redstone. 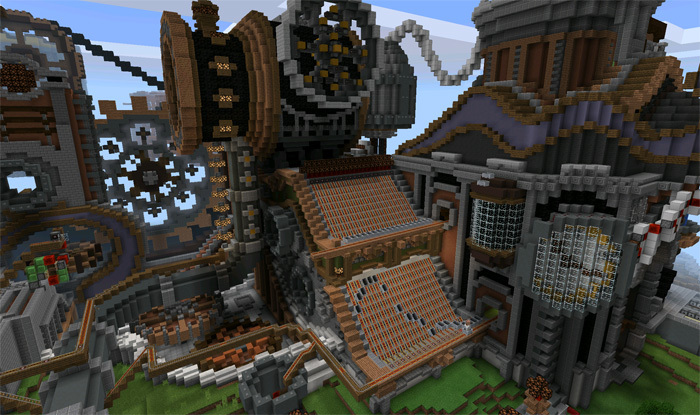 Redstone is Minecraft’s version of electricity and circuits. It can even be used to make virtual redstone computers and calculators. In our Engineering with Redstone online summer camp, your child will learn about more than just electricity, circuits, and logic. That’s the easy stuff. They can also learn and grow in 5 areas: coding foundations, electrical engineering foundations, problem solving, design process, and creativity. Your child will learn the essentials of inputs and outputs, two concepts foundational to coding. Inputs are basically the source of power, such as a button, lever, or redstone torch. Outputs are where the power ends up, and in Minecraft common outputs include electric lamps, doors, locks, and more. Inputs and outputs are the foundation of any coding language. Through hands-on projects your child will learn how to create devices simple and complex that use a variety of inputs (buttons, switches, and sensors) and outputs (lights, doors, item sorters, etc.). They’ll also learn ways of controlling the signal between them mechanisms like delays and clocks. Cool! 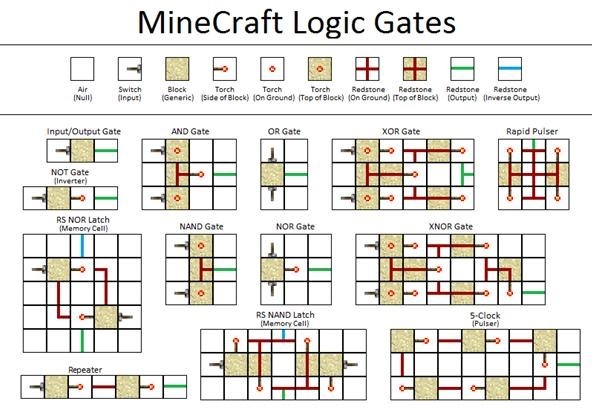 Logic gates, the building blocks of digital circuits, as they appear in Minecraft. Your child will also learn the foundations of electrical engineering. Working with redstone, they’ll learn to harness electrical inputs and outputs to create functioning machines. Individual redstone components, in fact, closely resemble those you might find in a computer processor. 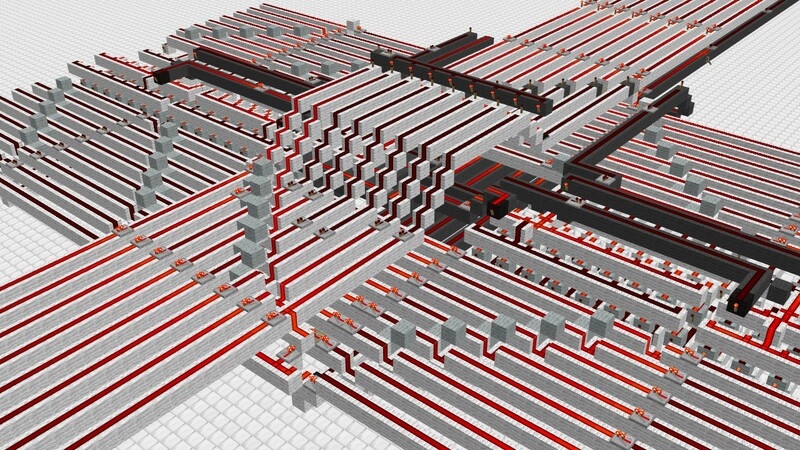 A computer processor, as it appears in Minecraft using redstone components. Courtesy of RevolutionalRedstone. Redstone can be the answer to a problem in Minecraft. For example, say you want to secure your treasure so no one can steal it. With redstone, you can build a combination lock or even a keycard system to secure your vaults. You can design machines to do other tasks, such as transport cargo, sort our items and so on. Learning to use redstone requires patience and a willingness to problem solve. When building a machine, a camper may run into problems with their design: a circuit may not work properly, or there isn’t enough space to build a machine. They can find solutions to these problems by backtracking to find where things went wrong, or rebuilding a machine to fit the space. This problem solving process teaches a core design principle around debugging and problem solving. Becoming a redstone engineer involves a lot of repetition, as well as making mistakes and problem solving. Machines almost never work on the first try. A camper may have to build and rebuild a machine several times just to get it working. Then they’ll need to rebuild it again in order to make it more efficient or add new features. Eventually, they’ll end up with a machine that does exactly what they want it to. This process teaches design skills, which have countless applications outside of Minecraft. To think like a designer is to know how to work best within constraints; working and reworking a design until it has become the best it can be. These skills improve the quality of work in anything from writing essays to baking cakes to building bridges. Once redstone is understood, the question arises: What are other uses for redstone? Tedious activities normally done by hand in Minecraft, such as mining, item sorting, and crop harvesting, can be automated. Redstone railways can move players across the land much faster. Doors can have locks, dungeons can have puzzles, and so on. Redstone is a powerful building tool that opens up endless creative building possibilities. A massive redstone rollercoaster made in Minecraft. 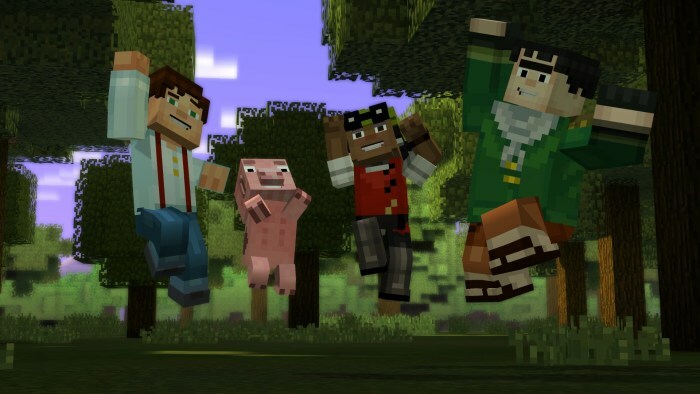 Courtesy of Mojang. Engineering with Redstone in Minecraft is the perfect place to keep your child learning and having fun this summer. They can learn these 5 skills and more. Sign up for Engineering camp by clicking here. 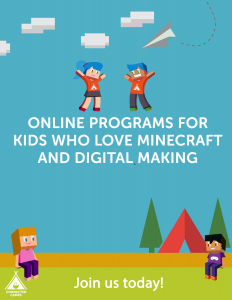 The 5-day camp includes 10 hours of online instruction on our custom Minecraft servers, led by expert counselors. Camp sessions run for 2 hours each day.